Chihuahua Dog Breed - Information About This Smart and Sassy Toy Dog Breed! 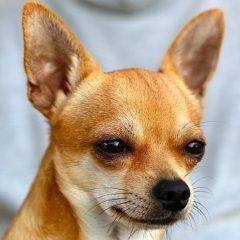 The Chihuahua dog breed, named after the state and city in Mexico of the same name, is easily recognized by its apple-domed head, large alert-looking ears and big eyes. The Chihuahua, is a lot of dog in a small package and has become a favorite family pet. He has also claimed a good deal of fame in the advertising world. While there is no doubt that this dog is one of the oldest breeds, there are different opinions and some debate about its origins. The Aztecs were thought to have revered the Chi as a sacred dog around the 9th century and some experts believe they were instrumental in its development by crossing the Chinese Crested dog with the Techichi - a small Asian dog. Others believe the Chinese also had a hand in its early origins. Archeological clues suggest it could date back even earlier that the 9th century. Whatever the case, it eventually found its way to north America where it has established itself as a much beloved toy dog. This little dog, considered to be the smallest dog in the world, stands a mere 6-9 inches tall, and weighs up to 6 pounds. The coat colors vary from jet black with tan markings to black and white spotted. The coat can also be any solid color, either marked or splashy. Other sizes of the Chi do exist within a group referred to as teacup dog breeds, although breeding to this tiny size is controversial! There are two coat varieties, one short and smooth, and the other longer with feathering on the tail and neck. Both have undercoats and shedding is about average. Grooming needs are easily handled. Chihuahuas are clean little dogs and like to stay that way, but they do need to be brushed about two to three times a week. A curry comb is an ideal brush for both the long and short-haired Chihuahuas. In addition to brushing, they also need regular routine attention to the ears, nails and teeth (as in brushing). Many dogs aren't fond of having their nails done but it can be made a lot easier for the Chi if you choose a nail clipper especially designed for small dogs, such as this one. When it's time for a bath, a tearless shampoo and conditioner combo is recommended as a precaution to safeguard their prominent eyes. The Chihuahua is one dog that can always use a coat or sweater because they lose body heat easily due to their scant body mass, not to mention that they look awfully cute in them! You get a lot of dog for your money with these little guys. Like a lot of the mini dog breeds, they think they are much bigger than they are which is born out by their strong personalities, being both feisty and mischievous. While being the smallest dogs ever recorded, the Chihuahua dog breed is known for its distinct boldness - a trait that can be expressed by an aggressive posture toward other dogs. On the other hand, Chihuahuas are very loving with family, while somewhat wary of strangers and make good watchdogs. Did you ever meet a Chihuahua you didn't like? Chances are if you did, it was not the dog's fault! Potential owners please pay attention to what I am about to say. These dogs are intelligent and can easily become dominant little yappers if they are not trained. 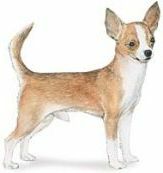 Chihuahua Dog Breed And Exercise? The Chihuahua is very alert and energetic as well as a fast-moving little dog around the house. Then again, while they may burn off some of their energy by being quite active indoors, all dogs deserve and should get out for walks, fresh air and a change of scenery. The value of walks and other activities, such as the off-leash dog park, should not be underestimated for a pet's mental health. The Chihuahua is adaptable to any type of accommodations. That being said, some of these dogs can be barkers and that generally does not work out well with close neighbors such as would be the case in an apartment setting. However, the well-trained Chi can be trained to keep the noise level at a reasonable setting! This breed is somewhat wary and edgy around young children and can be quite bold. For this reason and also because they are quite fragile, they are not usually the best choice for families with toddlers or small children. Families that include young adults who are considerate and sensitive to pets, would probably work out a lot better and enable everyone to enjoy this unique and special dog breed. The main thing to remember is that interaction between dogs (of any breed) and children should always be supervised by an adult. The Chihuahua dog breed is an ideal choice and makes an excellent companion for the elderly or more sedentary family. They are very loyal and loving. Food costs are modest, grooming is simple and exercise needs are easily handled. All in all, one of best toy dog breeds for seniors.